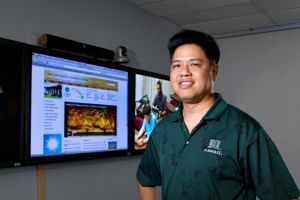 The University of Hawaii has implemented a wide-ranging distance learning system that relies on Panasonic’s “50 series” video production system for content generation. This telepresence videoconferencing structure allows more than 12 percent of the University’s 60,000+ students to complete graduate and undergraduate studies remotely by participating in an interactive telepresence system at a local campus of choice. The University’s department of Information Technology Services (ITS) made a large-scale investment in Panasonic gear in its transition to high-definition distance learning operations, including 17 AW-HE50S HD integrated pan/tilt/zoom cameras with HD/SD-SDI outputs, six AW-HS50N sub-compact live switchers with built-in MultiViewers, and six AW-RP50 remote camera controllers. The purchase also comprised 94 Panasonic professional displays for classrooms, control rooms and production work, including six TH-65PF30U 65-inch, 38 TH-58PF20U 58-inch and 11 TH-50PF30U 50-inch plasma displays, 32 TH-47LF20U 47-inch LCD displays and seven BT-LH1710 17-inch LCD production monitors. The University employs a Polycom RealPresence videoconferencing system. Four production studios have been established on the Mānoa campus to originate instruction that can be taken at any of the 10 university campus locations across six Hawaiian islands. Liu explained that each classroom studio is equipped with three HE50S cameras and six pro displays. An HS50 switcher, RP50 controller and LH1710 reside in an adjacent control room. Three additional studios have been set up at Maui College, which can originate as well as receive instruction.